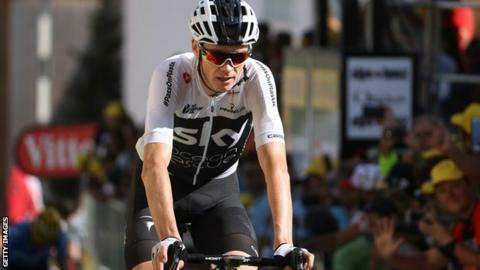 The handling of Chris Froome's asthma drug case is a "blow" to the World Anti-Doping Agency's credibility, says US Anti-Doping Agency head Travis Tygart. Froome was under investigation after more than the allowed level of legal drug salbutamol was found in his urine. Wada accepted there was no breach and cycling's world governing body, the UCI, dropped the case on 2 July after nine months. Tygart told BBC Sport he believes there is a "lack of transparency" over that decision. "The question is whether justice was truly served or did a star get an undeserved break," he said. "Unfortunately it's another blow to the perceived credibility of the global anti-doping movement." Wada and the UCI have released some details of Froome's case but Tygart, who led the investigation that saw former cyclist Lance Armstrong banned for life for doping, said without knowing exactly how the decision was reached, the case is "another shard that has damaged the credibility of Wada". Tygart added the lack of clarity was unfair to Froome, as it left the four-time Tour de France winner facing the "worst-case scenario" where he is "caught" between being seen as having benefitted from his high profile, even if his reputation has perhaps been "unfairly tarnished". "You can never un-ring that bell and it's why more answers have to be provided so that people have confidence that he's not just a star who got away with it - that's a natural conclusion," he said. "Athletes should not be accused or it be inferred that they're not clean until proven through the established process and that didn't happen here and he deserves the benefit of that presumption of innocence." Froome returned a level of salbutamol 19% over the decision limit of 1,200 nanograms per millilitre, when adjusted for dehydration. Wada rules allow for an athlete to try to prove they exceeded the threshold without taking more than the permitted dose through a laboratory test, called a controlled pharmacokinetic study, but Froome did not have to, with Wada acknowledging "it would be impossible to adequately recreate similar conditions" to when he took the test during his Vuelta a Espana win in September. Earlier this month, Wada science director Olivier Rabin said: "It's not a unique case but because it was Froome, a sporting celebrity, and it was put in the limelight, it appears to be unique - I have personally dealt with several in the past." "In leading the fight against doping in sport, Wada is sometimes forced to make difficult decisions related to complex cases that people, who are not in possession of the facts, do not understand or agree with. This is one of those occasions. Wada is convinced that, in view of the complex and unique circumstances of Mr Froome's case, the UCI reached a correct and fair outcome." Tygart claims Wada is "conflicted" as long as sports bodies are represented at board level - the agency's executive committee and foundation board are composed equally of representatives from the Olympic movement and public authorities. The American also called on Wada to reform its "broken governance model" to regain the trust of athletes and the public following its "poor handling" of the Russian doping scandal. "When you're conflicted and then you don't provide any information, it naturally causes people to be more sceptical of the decision and so if you're conflicted you have to provide all the evidence for your decision, especially one to exonerate a star athlete," he said. "Just remove the fox from guarding the henhouse. That would immediately restore the type of credibility that the global watchdog needs in order to give confidence." In response, a Wada spokesperson said: "Wada fulfils its mandate independently and in the service of clean sport." They added the agency has acknowledged the calls for a "strengthened, more independent Wada" following the Russian doping scandal by setting up a working group "charged with strengthening Wada's governance structure" that will report its final recommendations to the board in November. After Froome's case was dropped, UCI president David Lappartient told BBC Sport that Team Sky's wealth allowed them to fight it in a way other teams could not have done. Tygart said the potential impact of a team or athlete's wealth on anti-doping cases was "certainly an issue" and it should not be a system where a "high-profile athlete whose team have deep pockets try to exploit every nuance". He added it is a "sad environment" that wealthy teams are focused on winning to the extent they become "hypercompetitive and very defensive and not necessarily proactive in supporting clean sport". "It's not to say they are not for clean sport but they want to win because that's what's good for business," he said. "Companies who are profiting off the back of athletes and off sport ought to be doing way more than they're currently doing to support clean sport and fair play." In response, a Team Sky spokesperson told BBC Sport: "Team Sky's founding premise is to win clean, not to win at any cost.